Magic captures the imagination like nothing else. Brian Tyler and the accompanying musicians also capture us with another memorable musical score for the Now You See Me film series with the musical score for the magic-filled mystery/thriller/comedy Now You See Me 2 (also internationally known with the improved title Now You See Me: The Second Act) where a formidable magician team expose baddies for the greater good. 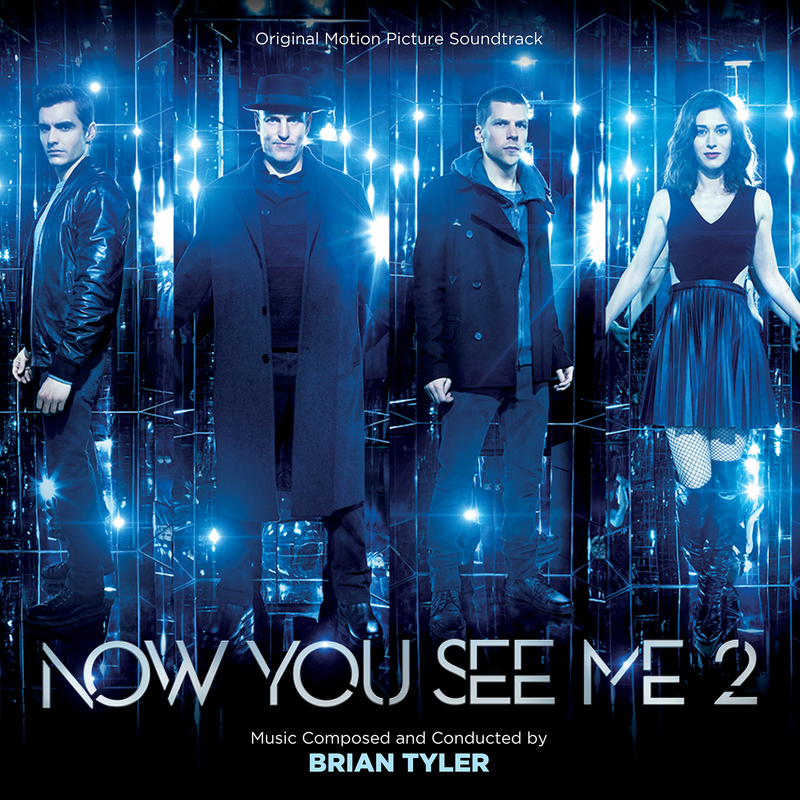 I enjoyed the 24-track, 80 minute Now You See Me 2 Original Soundtrack released on the Varèse Sarabande label and also heard this music in context during my viewing of the Lionsgate film Now You See Me 2. Listeners can easily connect with this well produced work covering several genres (jazzy heist/spy, classic orchestral, big band, police drama, capers, epic fantasy, etc.) as this enjoyable experience creates a memorable music that can easily stand on its own. The Now You See Me 2 Original Soundtrack pushes beyond a simple ‘strings for tension and drums for action’ method. Tyler and his talented musicians also include touches of Chinese music (e.g. “United”), which is the film’s dominant setting. Tyler creates a nice balance that reflects the great plot and characters who are either in the limelight or the shadows and how they navigate between the two. He improves on the “Now You See Me” theme, which flows effectively throughout this quality score while performing on bass, drums, guitars, keyboards and percussion as well as piano with Evan Duffy. After the roaring “Fanfare” and “Main Titles”, “300 Seconds” impresses with big emotion that reaches beyond the genre and also clocks in as the longest work at seven minutes and 25 seconds. “The Setup” follows and echoes James Bond films near the end then other highlights include short “Revelatory” with familiar movements and “Equivoque” with hard-driving percussion. The horns are strong throughout without overwhelming the other instrument sets. “Trifecta” has become my favorite. This impressive work has a “dance club” feel then familiar orchestral movements before an impressive build-up. “Bazaar Getaway” has a great lone horn with synthesizer feature near the end that showcases this score’s appealing variety. “Octa” pushes the tempo well and the electric drums and keyboards on “Diversion Tactics” keeps the impact even yet driving then about halfway through Tyler transitions into traditional drums/percussion, horns and strings for big movements that compliment base themes. “Deliverance” and “The New Horseman” are probably my least favorite tracks due to their average overall impact. “The Big Finish” and “Finale” dovetail the beginning themes well. This highly recommended (***1/2 out of four stars) musical score captures the grandeur of magic entertainment and the film’s satisfying experience. Available now digitally and on CD July 8, 2016. Brian Tyler continues building strong works in film (Iron Man 3, Fast & Furious, Final Destination), television (Sleepy Hollow, Scorpion, Children of Dune, Hawaii Five-0) and video games (Assassin’s Creed IV: Black Flag, Call of Duty: Modern Warfare 3) plus past collaborations (e.g. Constantine with Klaus Badelt (Pirates of the Caribbean: The Curse of the Black Pearl). Tyler also co-produced this original motion picture score, which was also mixed at Brian Tyler Studios and Studio H. The rapidly refining Tyler recently made his headline concert debut at London’s Royal Festival Hall this past May where he and the Philharmonia Orchestra, plus choir, performed a line-up of his various scores. Tyler also has amateur magician experience. The Now You See Me 2 Original Soundtrack is also available and features classic songs by The Drifters, Jimi Hendrix, Perry Como plus modern songs by 50 Cent/Lil’ Kim and Pharrell Williams plus four songs from one of the film’s star Jay Chou. A third film is on the way, so look for Tyler to complete a rare musical score hat trick in the future. This entry was posted in Music Reviews and tagged Brian Tyler, Michael Siebenaler, Mike Siebenaler, Music, Now You See Me 2, Tall Writer. Bookmark the permalink.